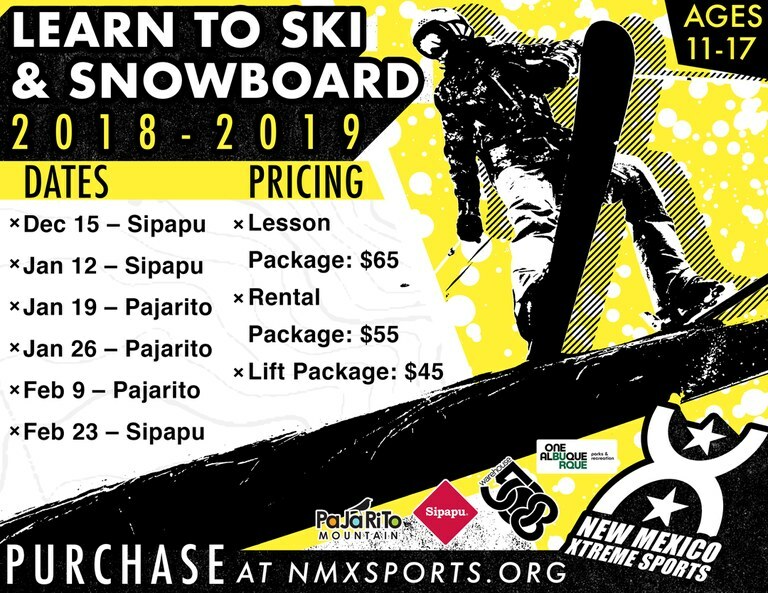 The City of Albuquerque Parks and Recreation Department is partnering with NMX Sports to offer ski and snowboard lessons to Albuquerque’s kids. Six trips are planned to either Sipapu Ski & Summer Resort or Pajarito Mountain to make staying active in winter fun, convenient, and affordable. Trips are for kids age 11-17. Lesson Package ($65): Comes with everything needed to learn or refine your skills – group lesson, lift ticket, and rental gear (helmet, boots, and skis or board). Rental Package ($55): For those who do not own their own gear, but have the skill set to ski or ride on their own. Lift Ticket Package ($45): For those who own their own gear and just need a ticket to ski or ride. *The resort location for each trip is dependent on snow conditions. All trips leave from and return to Warehouse 508 in downtown Albuquerque. Participants must arrive at 6:00 a.m. for a 6:30 a.m. departure. All trips return at approximately 6:30 p.m. Lunch and outer wear are not included in any of the available packages. Register online now at www.nmxsports.org! If you have questions, please call 505-768-5328.